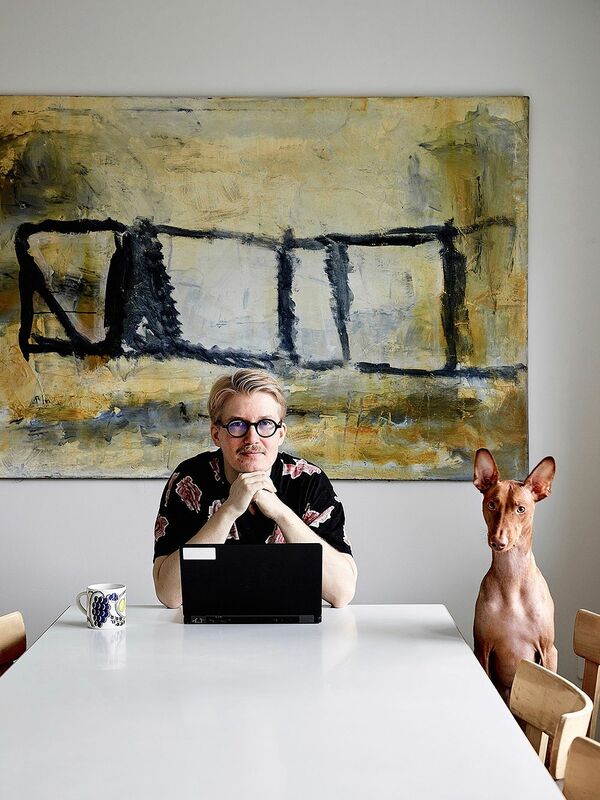 Olli-Pekka Koljonen's relaxed home hosts life, art, design and a dog. A dreary flat was reborn as a genuine, crisp gem. 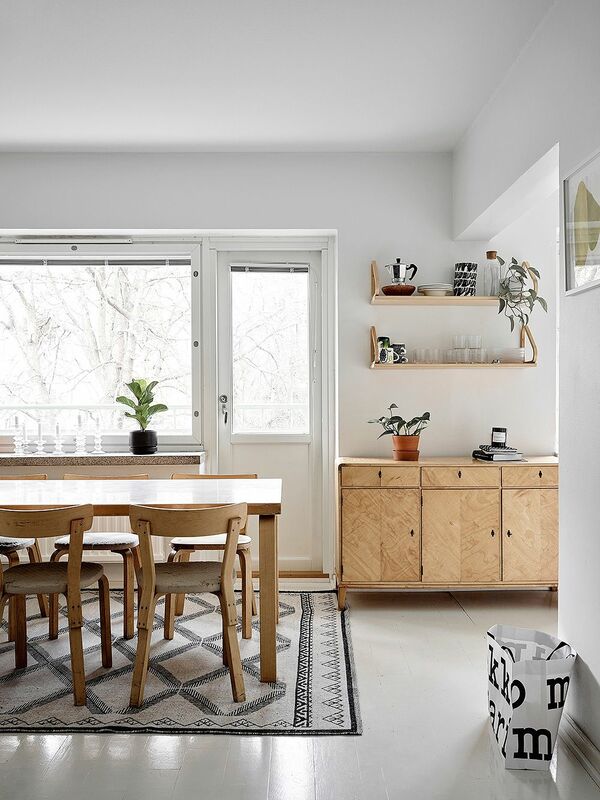 The dining area’s 1950s chest reminded Olli-Pekka of a similar chest at his grandmother’s home. It hides objects that are not in daily use. The Artek 112 B shelf holds everyday dishes such as the Marimekko Sääpäiväkirja bowls. Public relations manager Olli-Pekka Koljonen and Simo the Cirneco dell’Etna dog. 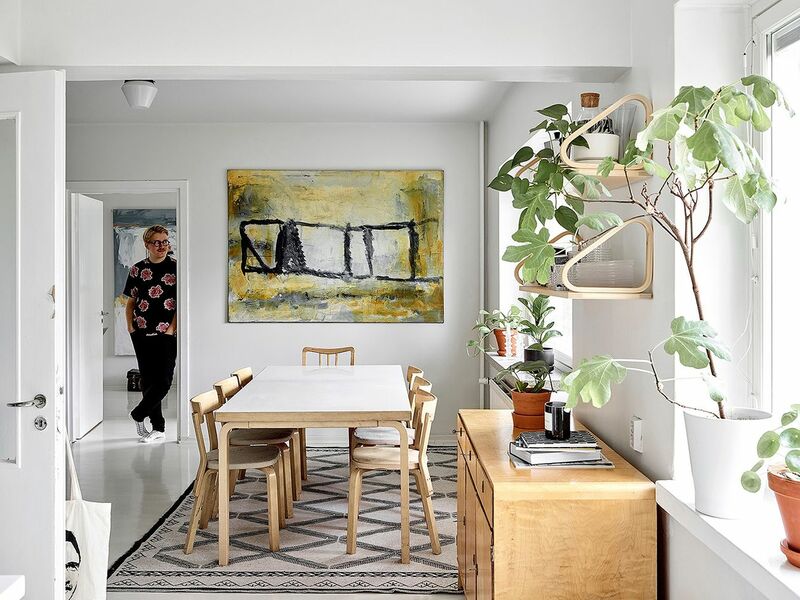 The 60 square meter home is in a 1957 apartment building in Helsinki’s Herttoniemi. The white background beautifully brings forward the furniture and art. Olli-Pekka often sits at the end of the dining table, especially when working from home, while Simo observes from the adjacent chair. The mug is part of Arabia’s Paratiisi series. WHAT DO YOU GET when you combine, art, design and a passionate collector’s flea market finds? Picture them in a dark and dilapidated two-room Helsinki flat. In the right hands, these ingredients become a fresh and crisp home. And what if you add a dog to the mix? You might find that, at the end of the workday, your favorite furniture has been somewhat rearranged and redesigned. 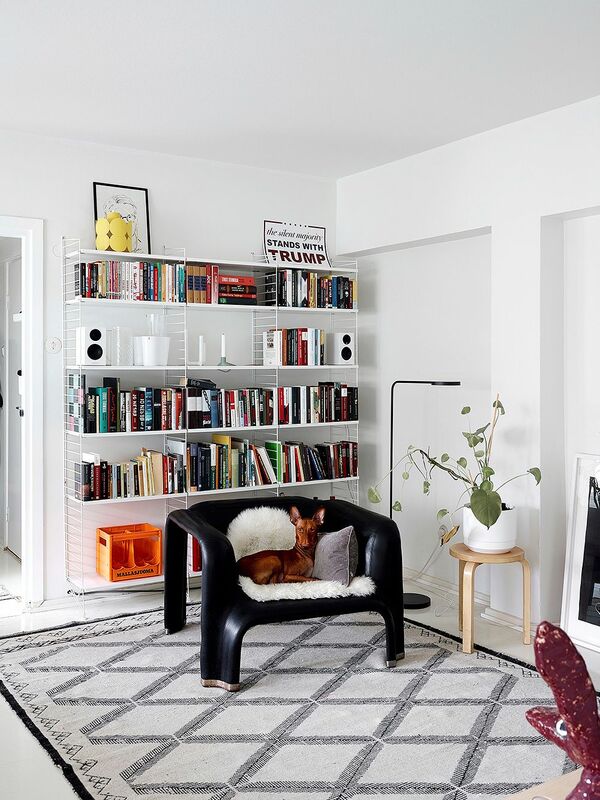 However, valuable design pieces and a dog can fit under the same roof provided you remember to add a healthy dose of relaxed attitude. 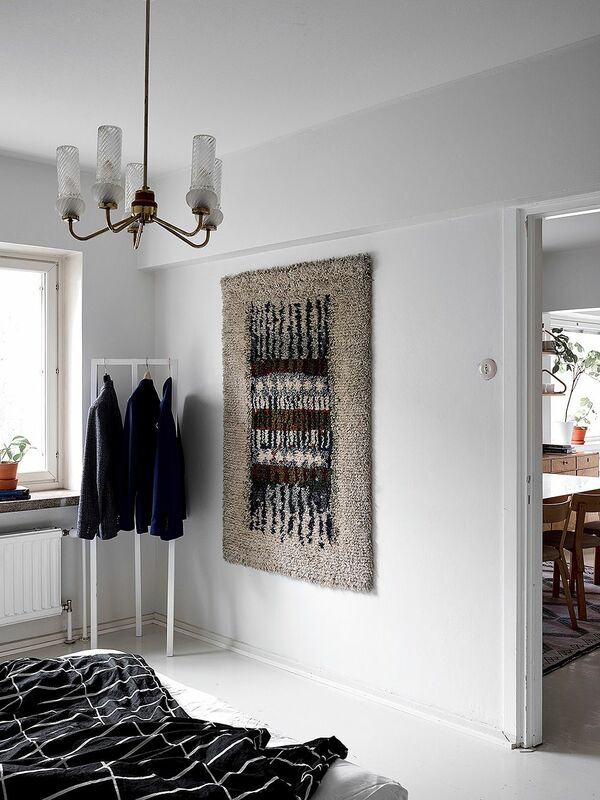 Olli-Pekka, you have a lot of vintage items in your home, and yet it looks fresh. How did you accomplish this? The bookshelf is the only furniture that I bought new. I like a simple style. I don’t want to bring disposable items into my home. Instead, I prefer timeless pieces and solutions. During the renovation, I painted all of the walls white. 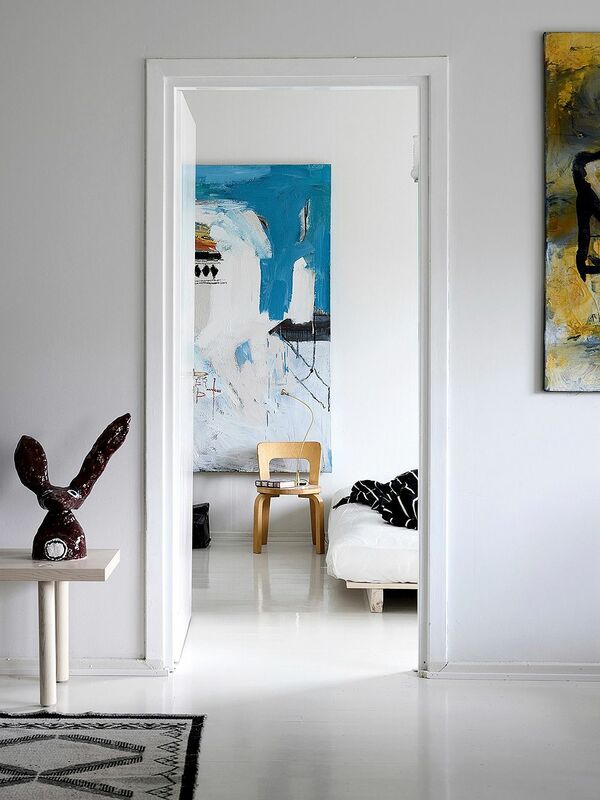 The art and furniture stand out against the white surfaces. My interior design is somewhat serendipitous – I do not always plan my acquisitions. The furniture sometimes hits the mark, and I fall for it. It is hard to imagine that the apartment was dark before the renovation. 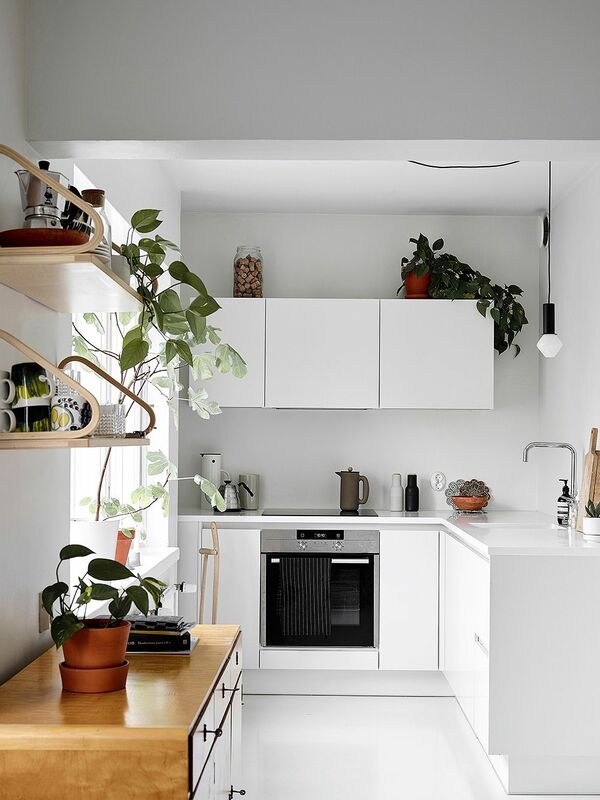 Olli-Pekka wanted a white, simple kitchen. He found it in the HTH kitchen catalog. The work surfaces and sink are Corian. The modern cabinets fit well with the building’s 1950s spirit. The Push coffee maker is by Muuto; the Bottle grinders are by Menu. What was your home like when you bought it? The apartment was in a sad state. It had been unoccupied for quite some time. The oak flooring had yellowed, and the home was very dreary and dark. However, it still caught my attention, as I really like the architecture in Helsinki’s Herttoniemi area. The views enchanted me from my very first visit and I could see what kind of home one could make it into. This place was exactly what I was looking for. 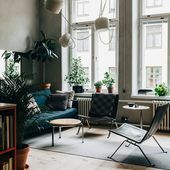 In addition to following online flea markets, I also like to keep an eye on apartment prices on the internet, and this was quite a find – a dreary apartment with a good layout. The building was quite ugly from the outside, but last summer’s renovation made it rather beautiful. What about design classics and vintage interests you? I am a visual person, and design has always interested me. The timelessness, durability, and stories behind classic design pieces fascinate me. I want to get things and furniture that I can look at from year to year. Durability is essential, and daily use and some added patina should only improve the furniture. In the dining area, your gaze is captured by Hannu Gebhard’s work. He was Olli-Pekka’s friend’s father. The painting’s yellow tones are a good match for the light-colored wood. The second-hand Artek 82B dining table was bought online. The chairs were from a student union. What are the best places to make such finds? My favorite is Tori.fi. Also, country flea markets can be real treasure troves: you can make great finds at fantastic prices. I have also participated in some online auctions. The best finds are discovered when you have the patience to monitor actively what is on offer. Keeping an eye on online flea markets became a habit, a habit that turned into a hobby. However, it is almost a rule that I end up buying something completely different from what I was initially looking for. It is hard to pass up on great finds, especially if the price is on point. The TV stand holds Olli-Pekka’s newest art acquisition, Jasmin Anoschkin’s Coyote statue. It somewhat a little like Simo so, after much deliberation, it was a must. The bed frame was bought from a Finnish carpenter who makes bases for futons. Artek's N65 children’s chair serves as a nightstand. Olli-Pekka found the right wall covering on Tori.fi. The Hay Loop Stand holds his work clothes. The Tiiliskivi duvet cover is by Marimekko. What are your best finds? What is the most important? My most important find might be my Mademoiselle chairs. I bought them at a great price on Keltainen Pörssi. Even though they never fit any of my homes, I could not give them up. Another great and one of my first finds was my Nanny Still Mango dessert spoons. They are quite rare, and I am sure that I will never give them up. I especially like Finnish design, and many of my online flea market purchases have been domestic classics. They catch my eye, even when I’m not really looking for them. What do you think is trending in vintage right now? It may be a boring answer, but everything that is timeless and stylish is always valuable. You should find what is in line with your style and of durable design. Simo in his favorite place, the Pekka Perjo Easy Chair. It is comfortably nest-like and great for napping in the center of the home. The poster is a souvenir from a Trump campaign event that Olli-Pekka attended. He is not a fan of Trump, but he is interested in politics and has previously worked in the field. The bookshelf is part of the String System series. Do any of your furniture pieces have any special stories? 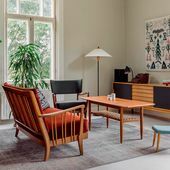 I had been looking at Pekka Perjo’s Easy Chair for a while, and I was pleased when I finally found one at an online flea market. I found a good place for it in my living room. After a hectic week at work I came home from the office and my dog Simo had rearranged everything in the apartment. He had managed to move the chair to the other side of the apartment and had taken big bites out of the upholstery. However, I am of the opinion that valuable furniture and a dog should be able to fit under the same roof. Everything should be meant for living. You cannot always avoid accidents but things, after all, are just things. Now the chair is in the apartment’s prime spot, though I rarely get to sit in it. Simo has made it his own and likes to nap there. It is not the only place that Simo makes his own in the apartment. Often, when I work on my laptop at the kitchen table, Simo joins me and sits on the chair next to mine. When Olli-Pekka moved in, he wanted to make the newly renovated bathroom his own. 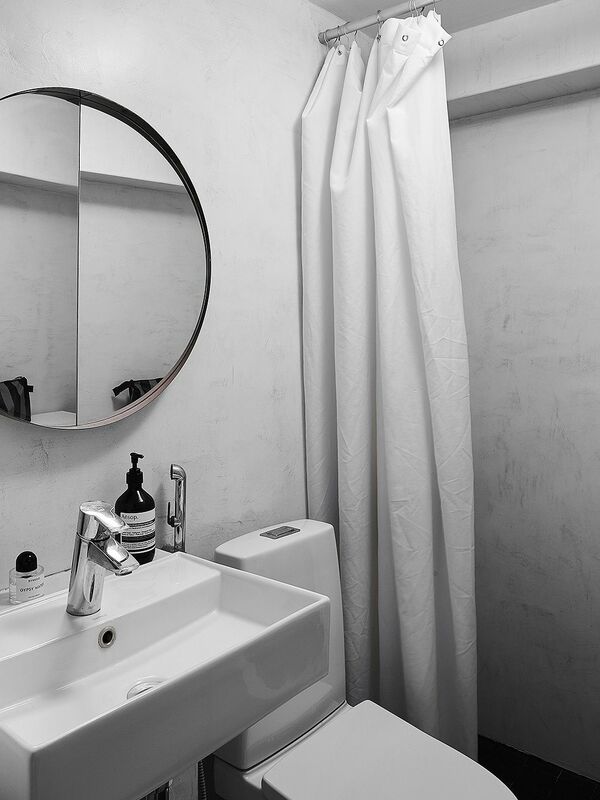 He redid the walls with light-colored micro-cement and changed the basin and mirror. At this moment, I am very interested in statues and sculpture. My newest acquisition is Jasmin Anoschkin’s Coyote. I have always liked her sculptures. The piece was in my friend’s art gallery in Hietalahti, Helsinki and I went to look at it now and then for about six months. I finally ended up buying it for my home. The sculpture somewhat resembles Simo, so I almost had to get it. What kind of plans do you have regarding your home and living? Even though I really enjoy it here I am still following real estate listings, you never know. My next home could take many forms. It could even be a house, as long as it is of its time. It is important that the home should be in need of some renovation and that it is close to running paths. Furniture, art and my everyday items, however, will always come with me. When I make a find, I rarely give it up. The story was originally published in Avotakka.